The La Liga season of 2013-2014 was unsuccessful for FC Barcelona considering their lofty standards, with their only trophy to show being the Spanish Super Cup. The team finished second in the league, lost in the final of the Copa del Rey and only managed to get till the quarter final stage in the UEFA Champions League. Lionel Messi and Neymar were no doubt a tough pair for opposition defenders to handle, but failed to get Barcelona over the line when it mattered the most. However, the arrival of Luis Suarez changed the attacking dynamics of the team like no one could have ever imagined. The usual questions were asked: Would Suarez be able to fit Barcelona's style of play? Was he at the level that the team expected of its players? Would he be a success at all? One and a half years later, the answer to all those question is an emphatic YES. While Lionel Messi will always remain the undisputed star at Barcelona, he is no longer looked at as the only player who can help bail the team out in difficult situations. Luis Suarez has scored crucial goals for Barcelona, like the winner against Real Madrid in his first ever El Clasico, and the goal against Juventus in the Champions League final which secured the trophy for his team last season. Already having scored 24 goals in the La Liga this season (more than any other player), Suarez is well on course to possibly breach the 40 goal mark in the league. He scores at an astonishing average of every 86 minutes. And that is only in the league. Suarez has scored 5 goals each in the Copa del Rey, Club World Cup and Champions League so far this season. 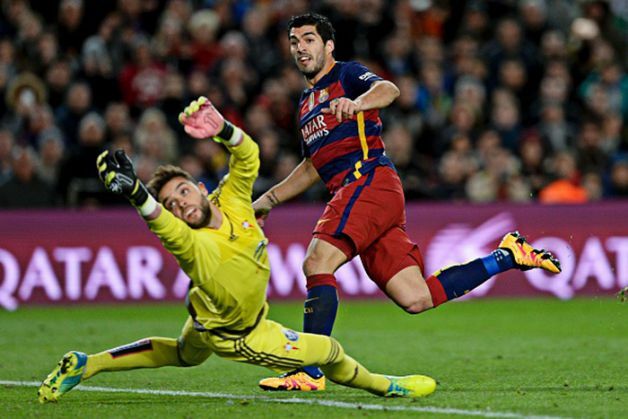 What sets Suarez apart is that he not only scores the goals, but also creates them for his other teammates. In total, he has played a part in 34 goals in the league this season, ten of them being assists. The only other player even close to this mark at the moment is Real Madrid's Cristiano Ronaldo, having played a part in 29 goals with eight assists, with Suarez having directly played a part in a goal more than any other player in Europe's top five leagues this season. How many more goals can he get? Suarez can potentially be involved in 22 more matches if Barcelona were to go all the way to the final in the Champions League. If he keeps up his current rate of goalscoring, it can see him easily go past the 60 goal mark in the season, and would be a monumental achievement. And with Messi already calling him the best striker in the world last week, this season has already been a successful one for Suarez - even if he doesn't score again. All that remains is the for Suarez to gain official recognition from FIFA when the Ballon d'Or ceremony is held next year to choose the best player in the world.